I was out of my favorite tea and decided to walk to Harvest Market which requires crossing the Highway One / Noyo River Bridge. 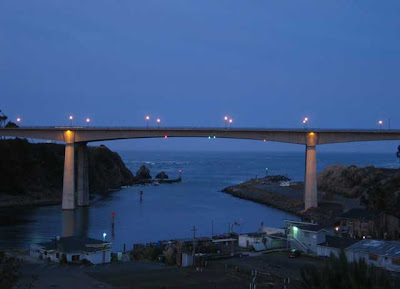 This bridge was recently rebuilt to the tune of around $30,000,000.00. While walking the pedestrian walk way on the east side I noticed expansion joints in the guard rail separating us walker/bicyclers from the car/trucks. 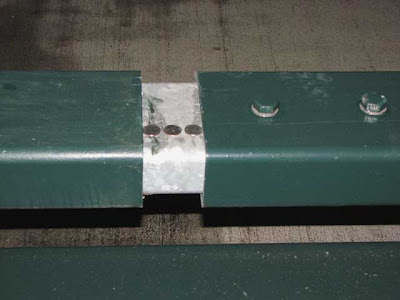 Expansion joints allow for the expansion and contraction of large object due to temperature changes. I discovered there were two of these joints located about equal distance from the north and south ends of the bridge. After buying my tea I headed home and decided to stop and measure the “gaps”. Not having a tape measure with me I decided to use the change in my pocket. As you can see, both gaps are just over .75 cents wide. When I got home I checked the outside temperature. 47 degrees. So, 47 degrees equals a little more than .75 cents. 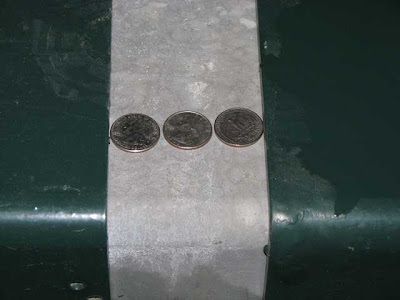 As warmer weather arrives I will revisit the expansion joints and see how much they close as the bridge warms up. And here I was thinking I was going to run out of things to do in this small town! !